Even with the best planned trip, a small defect can bring your fully occupied coach to an unexpected halt. In the worst-case scenario, this could happen at night or in a different country. For such cases, our OMNIplus 24h SERVICE is not only available around-the-clock, but also speaks your language. Delays are unwelcome news for both your wallet and your passengers – this makes a quick response all the more important. Our OMNIplus 24h SERVICE contacts an experienced service point near your location and takes care of your coach directly on site. If a fast repair on site or in the nearest workshop is not possible, OMNIplus 24h SERVICE will organize an alternative to get you rapid assistance. Around-the-clock reliability – that is the objective that our OMNIplus 24h SERVICE puts into practice. Our expertise is at your disposal when and where you need it. We are there for you – in all locations and for all your needs. 24 hours a day. 365 days a year. From the procurement of original parts to payment processing – our experienced emergency service partners guarantee both technical assistance and financial security. To use our OMNIplus 24h SERVICE, an OMNIplus ServiceCard is required for each bus. So that we can help you as soon as possible, we need the following information: Vehicle data (license plate and chassis number), owner ID, symptom description, location of the breakdown. If we need further information, one of our OMNIplus 24h SERVICE colleagues will contact you. 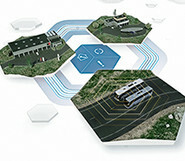 Intelligent data-linking between vehicle, service and your company.